Cushing's Disease is caused by enlargement of the pituitary gland in the brain (usually due to a benign tumour), which causes the production of too much hormone. In turn, this results in over-stimulation of the adrenal glands, which then produce excessive amounts of steroids. In older horses, the most common underlying cause is a simple age-related failure of the normal control mechanisms in the brain, although tumours are not uncommon. 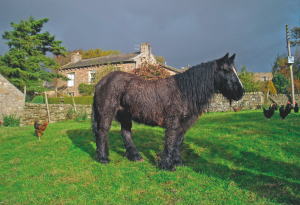 The older a horse gets, the more likely it is to develop Cushing's Disease. The symptoms of the disease are variable and some are much more noticeable than others. 50% of horses with Cushing's Disease will suffer from recurrent bouts of laminitis. This is a severe and debilitating condition involving inflammation and weakness of the hoof. Abnormal hair growth is another clinical sign of Cushing's Disease, with affected horses displaying a long, curly coat that looks as though it's been permed. The coat will typically grow thicker, paler and lose its shine. - Increased thirst and hunger. If your horse is put to field, recognising increased thirst may be difficult, especially if you use a self-filling water trough. Because of increased thirst, your horse is also likely to urinate more frequently which, again, is difficult to monitor. - Muscle wasting and weight loss can also be a sign of disease, despite your horse's good appetite. The abdomen may appear swollen or 'pot-bellied,' there may be fat deposits along the mane, and muscle in other areas may appear diminished. - Infections are more common in horses with Cushing's Disease because they have a weakened immune system. Cuts and abrasions may take longer to heal in affected animals. Because of the immune-insufficiency, worms can also be more of a problem as well as dental abscesses. As the immune system becomes less and less effective, any number of health complaints can arise. - Laminitis occurs a lot more in horses with Cushing's Disease. Why there is a link between the two is uncertain. It is currently believed that laminitis arises in horses with Cushing's due to increased levels of cortisol circulating in the body. If your horse experiences repeated bouts of laminitis, particularly in autumn and winter (when laminitis is uncommon), then you should have your horse professionally evaluated. A vet can make a diagnosis following a clinical examination, followed by blood and urine tests if needed. A blood sample is taken and injected with a dose of dexamethasone, which in normal horses, will cause suppression in blood cortisol levels. In horses with Cushing's, cortisol levels are not suppressed and instead remain elevated. If this is the case, a diagnosis of Cushing's Disease is made. At present, Cushing's Disease cannot be cured, but it can be controlled by medication. The treatment of choice is Prascend, which is the veterinary licensed form of the human drug Pergolide. Prascend is available as a tablet and is easy to administer dissolved in a small amount of water, which is then mixed in a little feed. The average pony will need half or one tablet once daily. Larger horses might need 2 or more tablets per day. Treatment often needs to be given for up to 3 months before the disease is brought under control. At this point it may be possible to try slowly reducing the dose, while still maintaining good control. We have had excellent results with Hilton Herbs Cush-X Gold. Our pony had ACTH levels of 515 Aug 2012, he was put onto Cush-X Gold and by Oct 2012 they had fallen to 330. By May 2013 they were within normal levels at 27.2. What is the best hard feed for a pony with cushings? At the moment I am feeding 'Healthy Hooves Complete Feed' with added garlic and cider vinegar.